This is a chrome electric guitar-style bridge plate, with a cutout perfectly sized for full-size humbucker pickups. 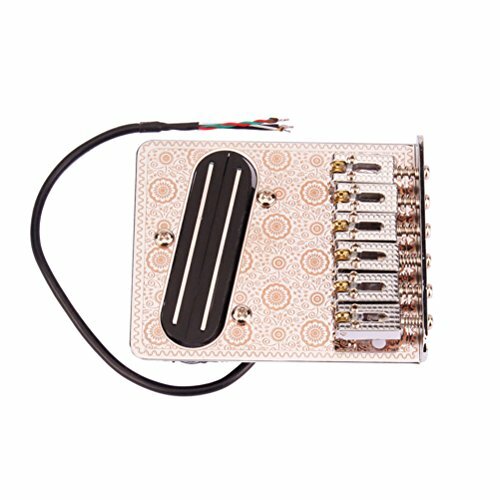 This bridge plate has 6 adjustable string attachment points. These are beautiful metal pieces, great for solidbody electric guitars, cigar box guitars and more! - Size: 9.7 * 8.1cm. - Classic bridge hardware for electric guitars. - Chrome humbucker electric guitar replacement bridge. - Change your single coil bridge to a beefy double coil humbucker sound. Color: As Shown. Material: Chrome. Classic bridge hardware for electric guitars. Chrome humbucker electric guitar replacement bridge. Change your single coil bridge to a beefy double coil humbucker sound.